During the course of exhibiting my work people often ask how long does it take me to create the piece. With this in mind I thought I would share something from the last couple of weeks that has taken up a lot of my time with subsequent disappointing results as it turns out. Researching various companies that print digitally onto fabric I came across a company in the Netherlands that will print onto several gorgeous fabrics including a very fine silk velvet. So after getting several samples sent from the company at a cost of 4.50 euro all up I decided to design a piece of art featuring our native eucalyptus in soft lemony cream, old man saltbush and prickly wattle. The design was a long evolution after working with other native flora that I have in my photographic library, from red bottlebrushes and grevilleas to feathers and butterflies. After many days and many hours of work at the computer I at long last was ready to order one metre of this lightweight, sumptuous fabric. This afternoon I uploaded the design and was ready to order when I nearly fell off my chair. The fabric was definitely not cheap which I knew (around 41 euros per metre) but it was the postal figure that shocked me, remembering the samples were only 4.50 euros…the end cost to post a very lightweight fabric which when folded up would be in mass less than an A4 parcel, was going to be over 80 euros! In hindsight, which is always a great thing, I should have made a mock order to see how much postage was going to be, but after the initial samples cost I naively thought it would be around 15 – 20 euros! So the upside is I have another gorgeous design that I would not have had if it weren’t for the silk velvet. 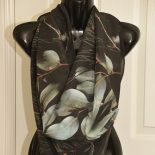 This entry was posted on March 16, 2019 by sharongreenaway in #flora, #photography, #photography as an artform, #sharongreenaway and tagged australian, design, fabric, flora, photography, Sharon Greenaway, wearable art.